The Supreme Court said that it would take up a case this term to decide whether the Trump administration can add a citizenship question to the 2020 census. Even with candidates already running in this year's battle for control of Virginia’s House of Delegates, the Supreme Court heard arguments Monday that could see the district lines changed again ahead of June's primaries. Questions from the justices suggested a potential liberal-conservative divide on at least some of the issues in the case, including whether House Republican leaders challenging a lower court finding that 2011 maps were unconstitutionally drawn based on race had standing to file the appeal. As is typical after a Supreme Court argument, all sides were optimistic but cautious about reading too much into the justices’ questions. A three-judge District Court panel ruled the General Assembly wrongly set a 55-percent minimum threshold for districts meant to ensure black voters had the power to elect candidates of their choice without flexibility to adjust based on individual areas, which had the effect of diluting black voting power in other districts. After providing lawmakers with a chance last year to redraw the lines, the court implemented new lines this winter that state elections officials have rushed to implement ahead of this spring’s primaries. At arguments Monday, several liberal justices questioned House leaders’ standing in the case and appeared to agree with the lower court decision that the lines were unconstitutional. Justice Sonia Sotomayor warned if House Republicans can challenge this ruling, it would invite complete discord over who represents a state when a law is challenged. “This is a radical new step,” Sotomayor said. Justice Samuel Alito suggested the standing issue might be one of state law, which needs to be asked to the Supreme Court of Virginia, since Democratic Attorney General Mark Herring declined to appeal this case to the Supreme Court. Chief Justice John Roberts pushed to move beyond that question, though, and appeared more concerned that Supreme Court precedent gives deference to the findings of trial courts, even when those findings in a second trial are different from those in the first. The panel reconsidered its original ruling in the 5-year-old case after a previous Supreme Court decision in this case, and the witnesses considered most credible in the analysis, also changed. “It seems an awkward position for us to be in,” Roberts said. Roberts also raised more practical concerns, since Democrats do not challenge gerrymandering that benefits them and Republicans do not challenge gerrymandering that benefits their party. Marc Elias, representing the Democratic voters who filed the lawsuit, said the different standard for the Senate map drawn at the same time and the lack of reasonable justification is the issue. “If the state creates a 55-percent blanket rule because of how African-Americans in a rural area vote … then it has engaged in racial stereotyping,” Elias said. Justices Sotomayor, Stephen Breyer and Elena Kagan suggested the judgments should be made on a district by district level rather than in a blanket fashion, or there should at least be some effort to do that based on a variety of factors other than just race. “They drew lines in the middle of the street with black houses on one side and white houses on the other,” Sotomayor said. Former Solicitor General Paul Clement, representing House Republicans, said that would be too difficult. “These districts perform very differently in off-year House of Delegates elections … there’s much less turnout [than a presidential year],” Clement said. Virginia holds House of Delegates elections the year after U.S. House elections. The maps at issue were approved by the Justice Department as required under the Voting Rights Act, and they have been in place for four election cycles. They were passed with significant support from Democrats in the legislature at the time, including 12 of 14 members of the House’s Black Caucus. Today, Republicans control the House of Delegates 51-49 following significant Democratic gains in 2017. November’s elections that follow June’s primaries could have even more significant long-term impacts on control of the chamber, since new legislators will be responsible for drawing the state’s next map. Virginia House Speaker Kirk Cox acknowledged after the arguments that if Republicans win on all issues, the June primaries would likely need to be delayed so that voters can be reassigned to the original districts. The map drawn by the lower court to reverse the racial gerrymandering could boost Democrats further, including in Cox’s own district. He remains confident he can win even under the new lines. Cox attended arguments along with House Majority Leader Todd Gilbert; Del. Chris Jones, who led work on the 2011 maps; and Del. Rob Bell. Herring said outside court that he wants this case to be over so the state can move on. “This case has cost Virginians four years, multiple elections under unconstitutional districts and probably more than $10 million, most of which has been spent by House Republicans to defend racial gerrymandering,” he said. Herring has been trying to emerge from an admission last month that he once wore blackface as a University of Virginia student. “This redistricting plan sorted voters based on race, and that is wrong,” Herring said. 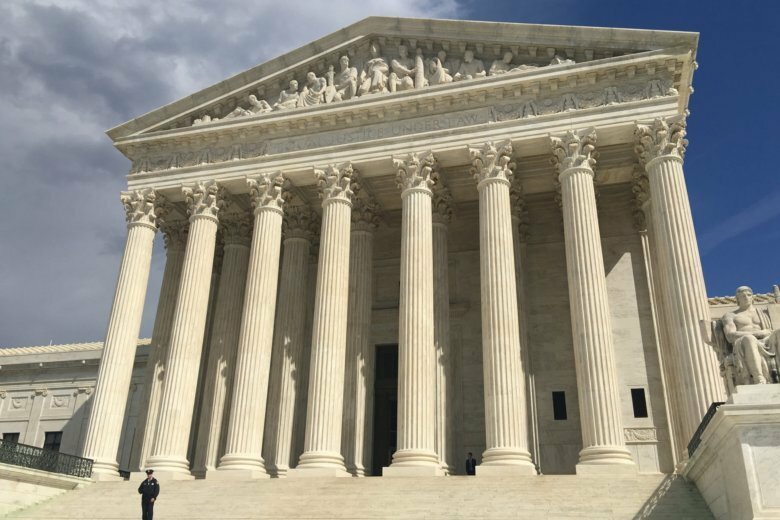 WTOP’s Max Smith reported from the U.S. Supreme Court in Washington.